The Smith Premier 10 was the last in the legendary line of Smith Premier full keyboard typewriters. It was also the only frontstrike typewriter with a full keyboard ever built. 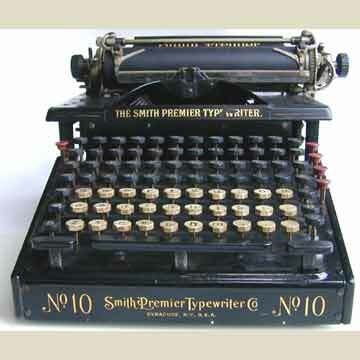 And it was the last of the Smith Premiers that were produced by the Smith Premier Typewriter Company itself. There is more than the double keyboard that reminds us of the earlier SP typewriters. The platen of the SP10 chas to be taken off the machine in order to replace the ribbon, that was fixed in the back of the machine. When the Smith Premier Company finished business, this was not the end of the legendary name. The Remington company used the name for many years on certain models.